I'm going to continue in the theme of anachronism, and we'll pretend that it isn't Wednesday, that mini-foodie 2 did not drop a heavy object on the hard drive and thus crash the computer and require a new hard drive and reinstallation of EVERYTHING. Let's pretend that, shall we? So, on Monday (when I was GOING to share this, until the aforementioned incident), in keeping with my goal of eating more vegetarian and vegan meals (emphasis on the latter) this year, we had a delicious (and satisfying) vegan feast of a crockpot curry with marinated, grilled portobello mushrooms. Hubs was skeptical when I mentioned the idea, and even more skeptical when he got home and smelled it (apparently kale + slow cooker = whole house smelling like cabbage.....). I can say, however, that hubs completed enjoyed the end result (can't say the same for the mini-foodies....they are usually pretty good, but they just really didn't love this). Successful slow cooking is a bit of a delicate art - you can go on Pinterest and find five zillion recipes that proclaim that you can cook pretty much ANYTHING in a slow cooker, and while this premise isn't strictly wrong, it is a bit misleading. 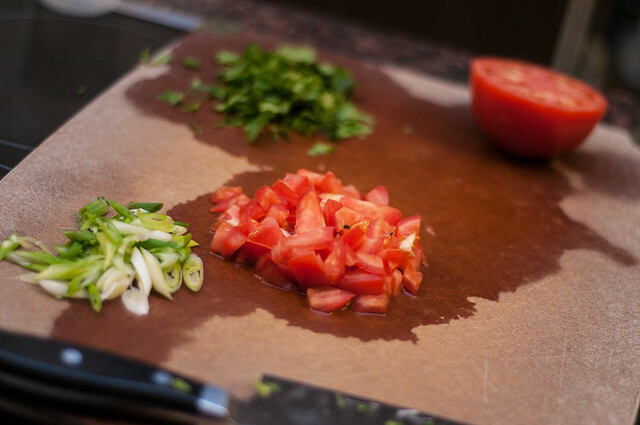 One of the things that makes food delicious is contrast in texture and taste. And when you put a pile of ingredients in a slow cooker for 8-10 hours, while you are away at work, what you have is pretty much the opposite - no contrast in texture and no contrast in taste, because everything tastes the same. There is the odd throw-it-in dish where this mostly works (like some stew recipes), but a lot of crockpot recipes garner criticisms that they taste like a uniform bowl of mush. Which they do. 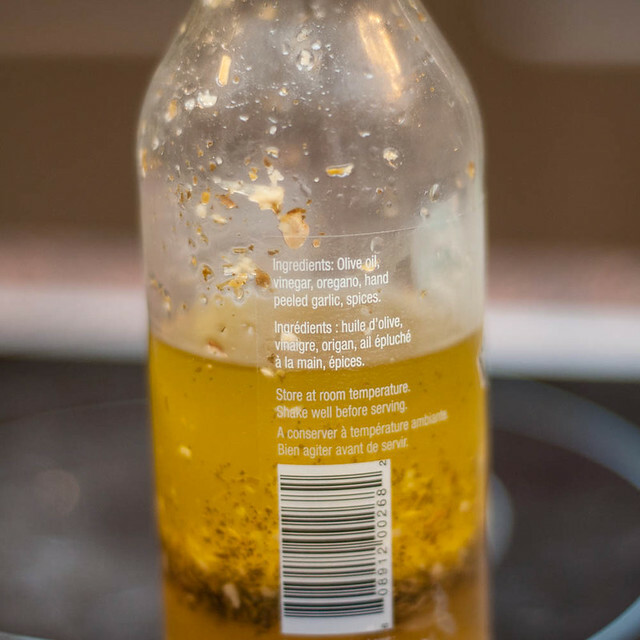 So here's my advice on mitigating that, while still staying pretty close to the idea of an easy slow cooker meal (i.e., nothing that requires you to do something every hour or two, because that's just not feasible when you're gone to work for the day, or, huge pet peeve, slow cooker recipes that take five hours - this is seriously NOT helpful). The key principle to successful slow cooker meals is that you need to add texture and flavour contrast. 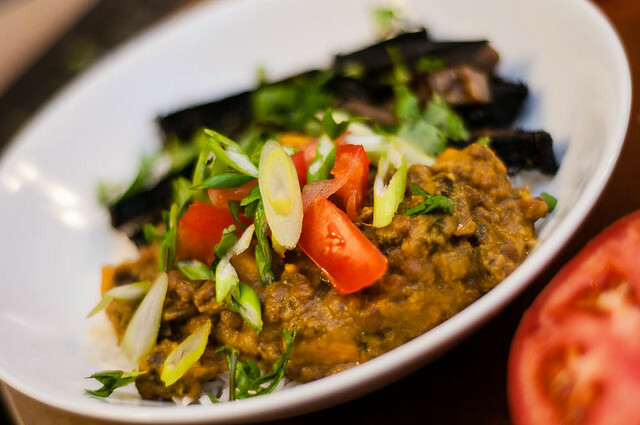 One of my most popular recipes (and one that's also been featured on Clean Eating) is my crockpot beef curry, and it in particular works because the chickpeas retain some texture, stirring in peas at the end adds texture and flavour, and when you serve it with the fresh naan and the yogourt sauce, you've added additional layers of flavour and texture, thus building a satisfying crockpot meal and making your belly happy. I've also pinned a lot of crockpot recipes (haven't tried them all, though I usually do go back and comment once I've made something) and if you look through my board, you'll notice that most of them incorporate added texture/flavour through one method or another. I think the easiest way to do this is through toppings - things like chopped tomatoes, green onion, yogourt/sour cream, cheese, chopped nuts, avocado, dried fruit, etc. (whatever suits the recipe). 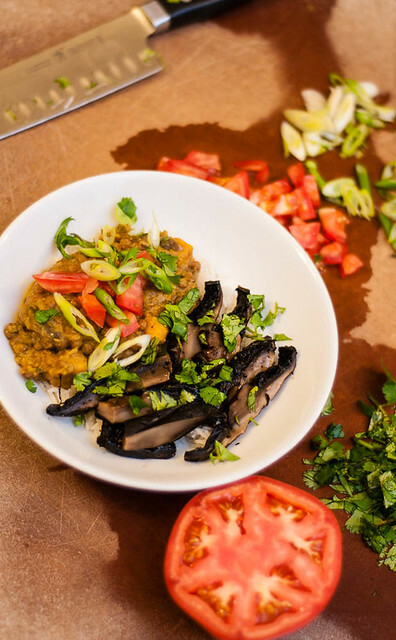 To make these curry bowls, I took the initial recipe (which I changed a bit from the inspiration, and which I knew from looking at would be a pile of mush after slow cooking) and topped it with a mixture of tomatoes, cilantro and green onion, as well as some sri racha. 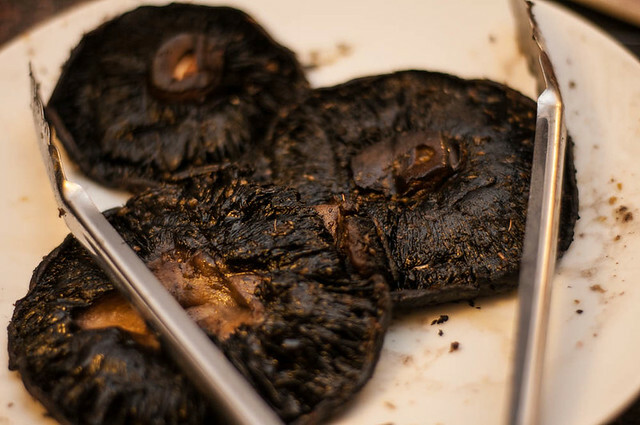 Serving the recipe with the grilled portobello caps added additional texture and flavour contrast and made this an entirely satisfying, delicious (and easy!) dinner. And not just a bowl of mush like this. Isn't it perfect? How can you go wrong? Anyway, I did my ultimate in laziness and just poured some dressing over the portobellos in the morning, and then had hubs grill them in the evening while I was chopping my toppings and the rice was cooking - dinner was on the table within 25 minutes of getting home, and that to me is pretty much awesome. 1. Chop the onion, garlic, ginger and sweet potatoes. 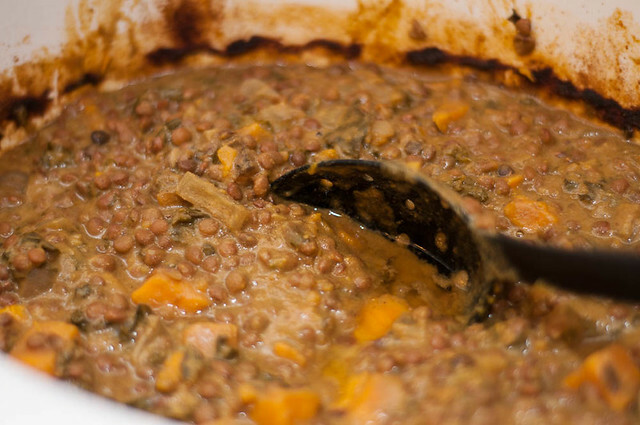 Combine in a large bowl with lentils. Add the tomato paste and stir until it coats things somewhat. Add curry powder and curry paste and stir (I find this is the best way to distribute the spices for slow cooking - otherwise they clump together). Add the lentils and stir, so they also get coated. 2. Dump the vegetable mixture in the slow cooker. Add the coconut milk and water, stir and cook on low for 8 hours. (You can also cook the kale in the slow cooker all day, but like I said above, your house will smell like rotten cabbage and it will lose texture - I'd turn the slow cooker to high when you get home, stir in the kale, and let it cook while you do the rice and other things). 3. 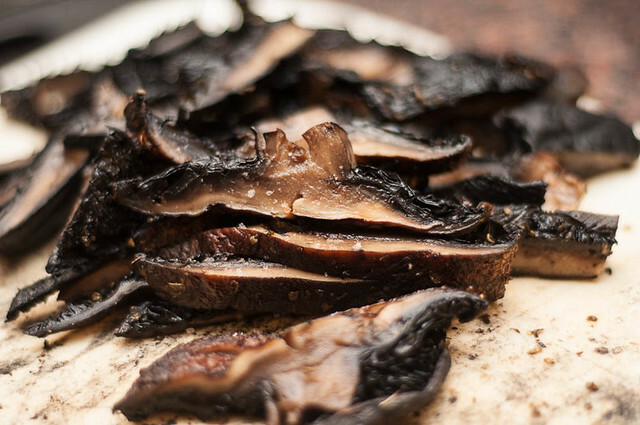 Combine the cleaned mushrooms and your marinade. Refrigerate them and let them sit for 8 hours. 4. When you get home, add the kale (I suggest pre-chopping it if you have time), start the rice, preheat the grill (you could pan-fry if you don't have access to a grill). 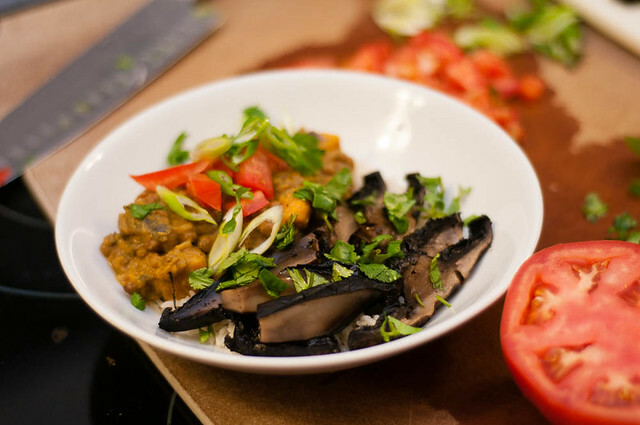 While the rice is cooking and the mushrooms are grilling, chop your toppings. 5. 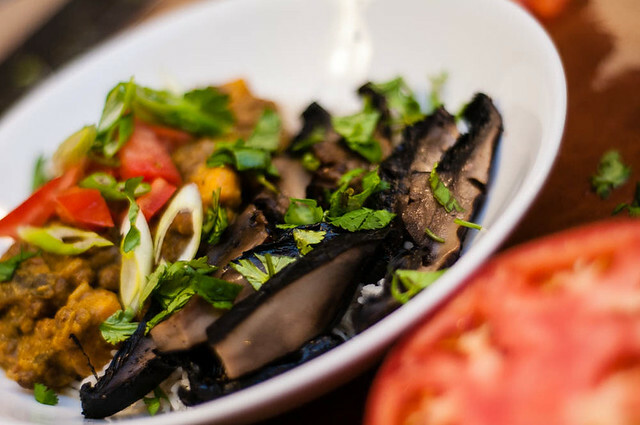 Serve a scoop of rice, topped with a ladle of curry, some sliced grilled mushrooms, and a generous handful of toppings (and hot sauce!). Enjoy! This will easily feed 4-6 people. Enjoy! Anyone else have any food-related resolutions? Check out my vegetarian/vegan board if you are looking for inspiration! Thanks for reading! FYI - you add the lentils twice in Step 1.